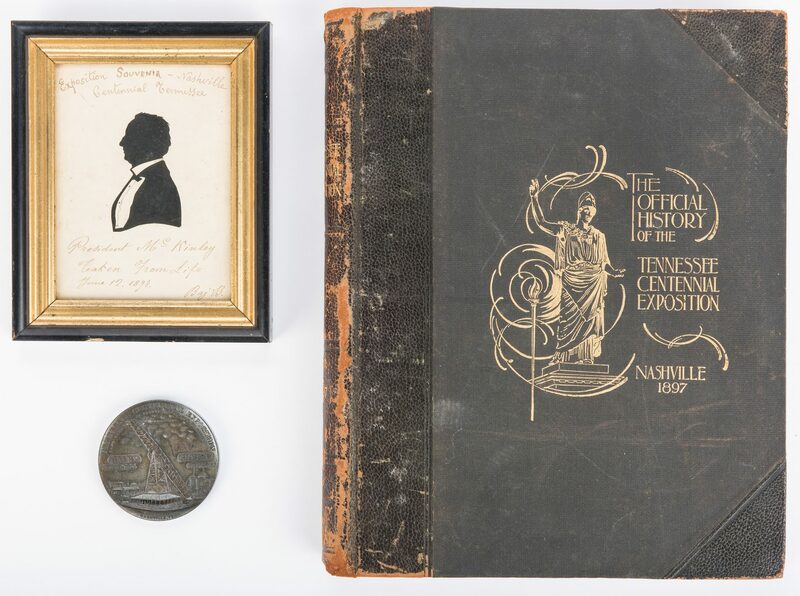 Three (3) Tennessee Centennial memorabilia items. 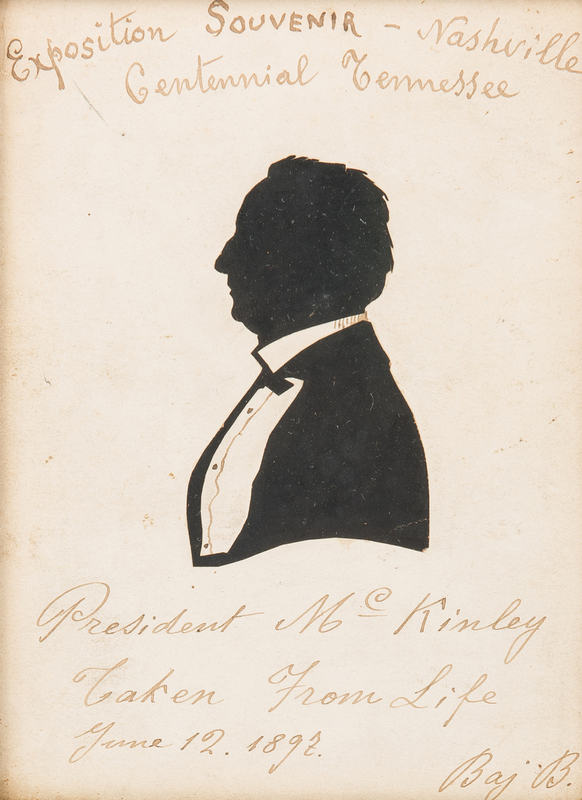 1st item: Silhouette depicting President William McKinley with the captions "Exposition Souvenir — Nashville Centennial Tennessee" and "taken from life June 12, 1897", above and below the image. Signed "Baj B." lower right. Housed under glass in a black painted frame with gilt wood rabbet edge. 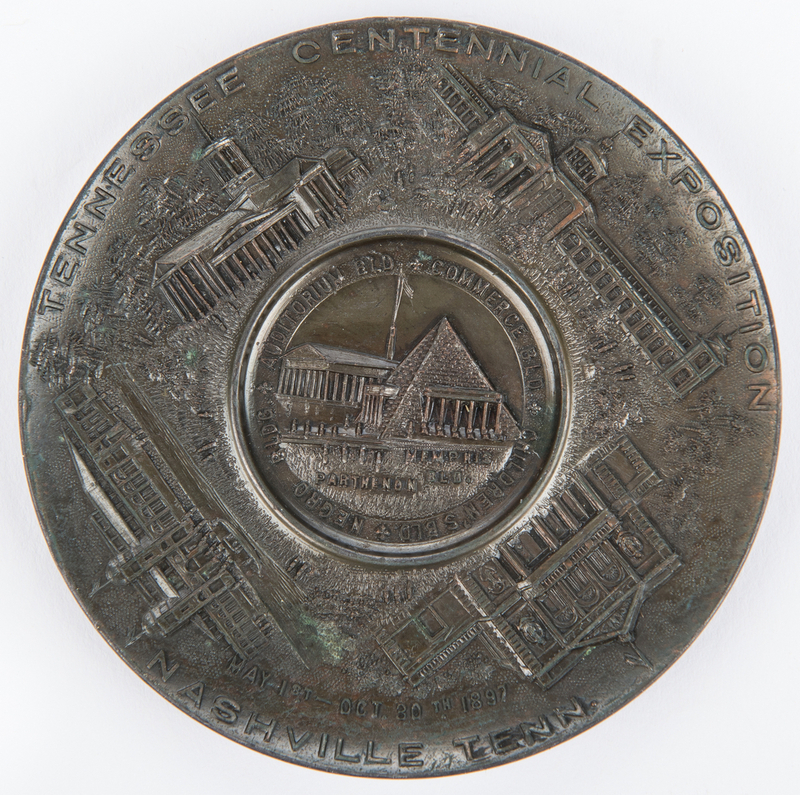 Sight – 5 7/8" H x 4 3/8" W. Framed – 8" H x 6 1/2" W. 2nd item: Souvenir medallion depicting the "Giant See-Saw" obverse, and the main buildings, including the Parthenon and the Memphis-Shelby pyramid, reverse. 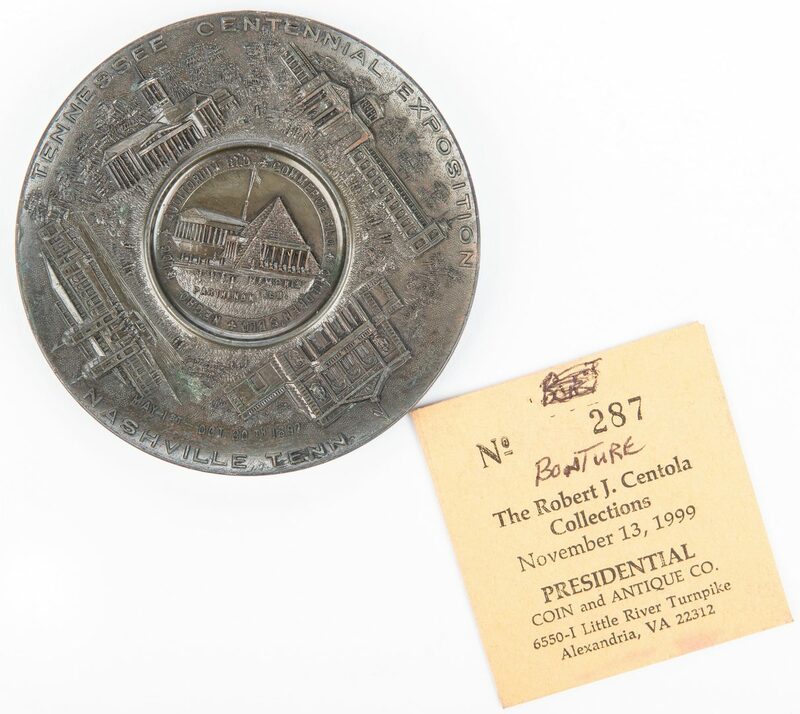 Includes a typed note from the Robert J. Centola Collections, Alexandria, VA, dated November 13, 1999, No. 287. Housed in a navy blue faux leather box with white satin lining stamped "Jose Muniz Ottero…Rue Buenos Ayres…" interior of lid. Coin – 3" dia. 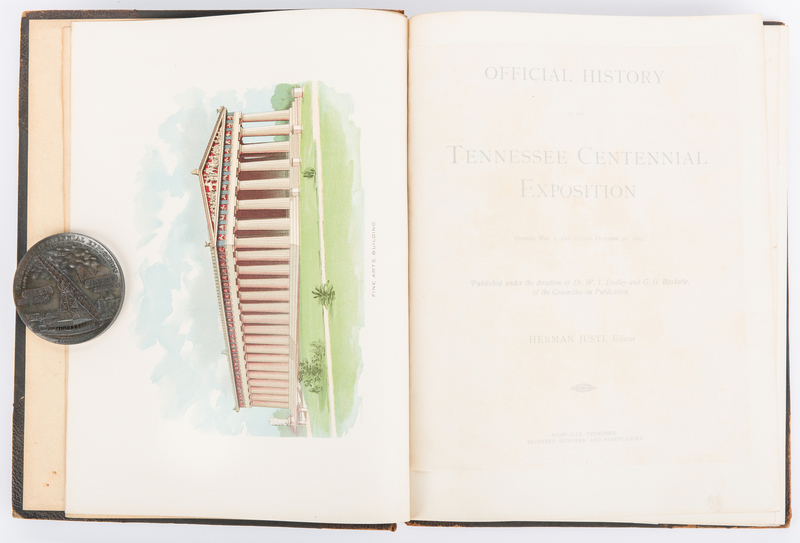 Box – 1 1/8" H x 5 1/4" W x 5 1/4" D. 3rd item: "Official History of the Tennessee Centennial Exposition Opened May, 1 and Closed October 30, 1897" edited by Herman Justi, published under the direction of Dr. W. L. Dudley and G. H. Baskette, of the Committee on Publication, Nashville, TN, 1898. Folio, hard bound in black cloth and half leather bindings with gilt title lettering on front cover and spine, 495 pages including Index and Appendix. 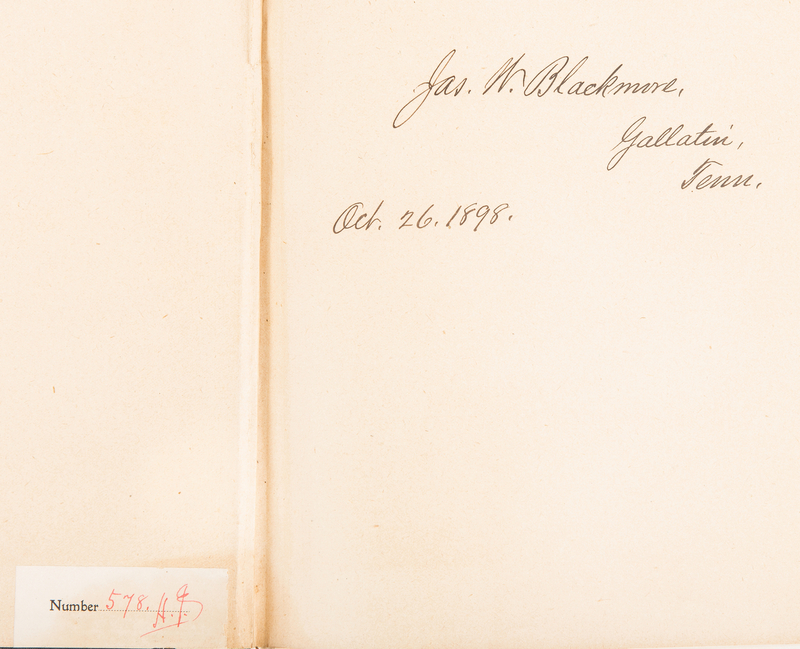 Inscribed and dated by James W. Blackmore of Gallatin, Tennessee, October 26, 1898, front end paper. Possible library label reading "Number 578.A.9." pasted inside of front cover. 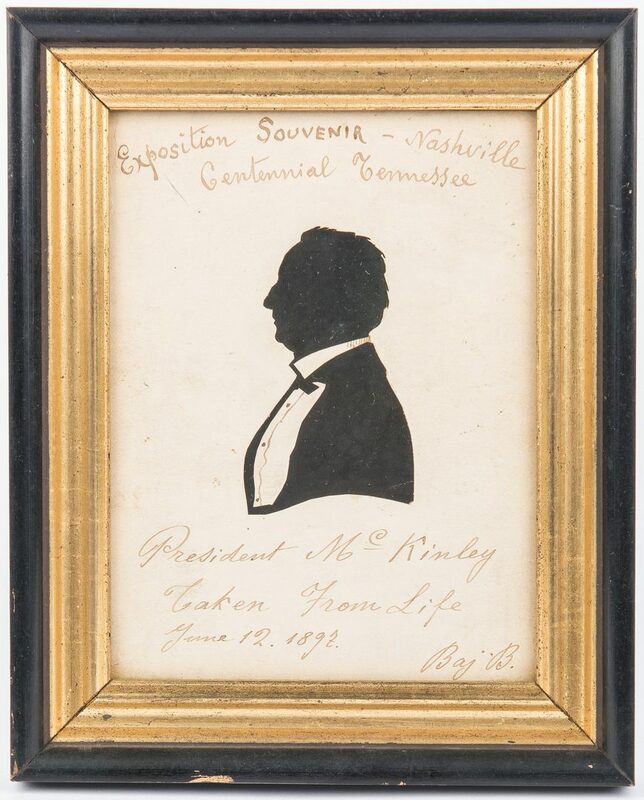 14" H x 11 1/4" W x 1 1/4" D. Note: James W. Blackmore (1843-1914) was a lawyer and a Tennessee State Senator, 1873-1887. Provenance: The collection of internationally known ragtime pianist and historian Johnny Maddox, Gallatin, TN. CONDITION: 1st item: Overall good condition with scuffs. Not examined outside of frame. 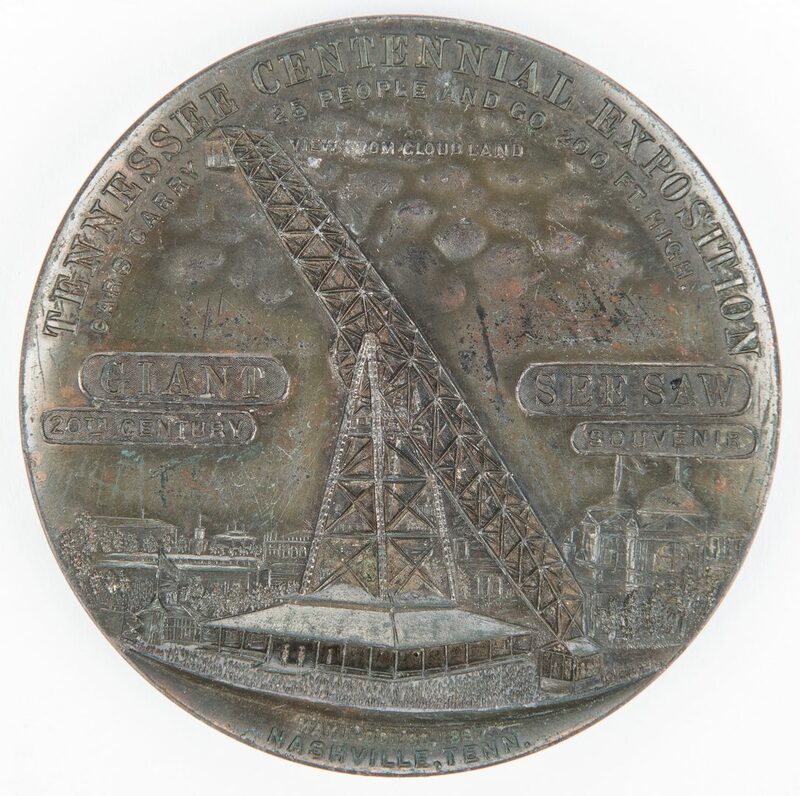 2nd item: Medallion in overall good condition with surface scratches. Areas of loss, largest 1 1/2", to edges and surface of box. Areas of picking, discoloration to satin lining of box. 3rd item: Overall good condition with areas of loss to leather, largest 7 1/2", and surface scratches to cloth covers. 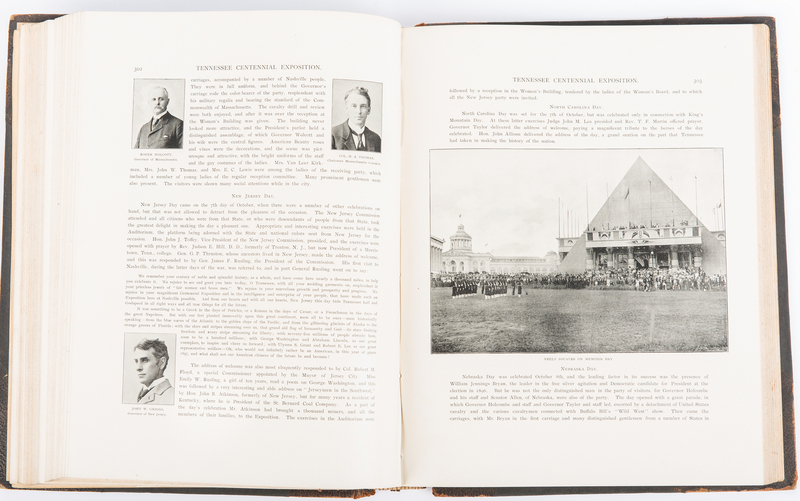 Pages appear collated and in very good condition.